The Latin term monumentum, from which the English ‘monument’ is derived, is related to the verb monere, ‘to remind’. Monuments are thus tangible, visible manifestations of human memory. Often monuments are inscribed, to aid the memory of those who want to remember, and that of future generations, as to why a certain monument was erected – be it specific to a person, an event, or gnomic, i. e. in the form of some general wisdom. Monuments and inscriptions form a unit that cannot be dissolved, and it is the conjunction of the two that makes for a particularly powerful tool. But what if the language of the inscription cannot be understood by (most or at least some) of the public that it addresses? What happens if neglect allows the monument itself to decay? One could argue that in those cases memory will fade with the monument itself, and neglect will turn into ignorance. The Latin inscriptions from Reading, whether ancient, mediaeval, or modern, provide numerous telling examples for this view. Why exactly is this on display in Reading’s Broad Street? Older residents of Reading may remember that the building was not always that of HSBC, but was once the location of the Midland Bank. This bank was acquired by HSBC in 1992, and it was rebranded in 1999. 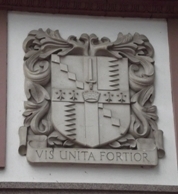 The arms with their Latin motto were that of the Midland Bank, originally founded in 1836. 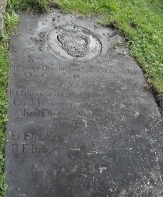 This entry was posted in Epigraphy, History of Reading and tagged Edward Dalby, Latin Inscriptions, Public History, Reading. Bookmark the permalink.